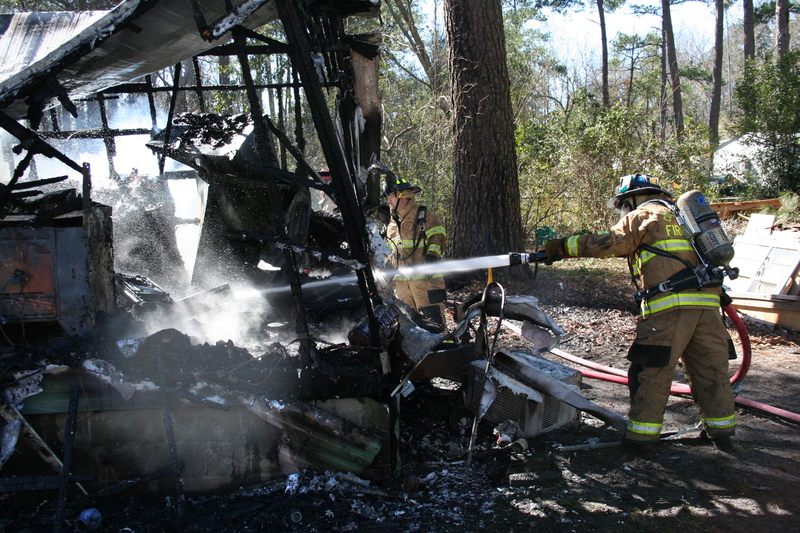 Fire-Rescue responded to two building fires Saturday morning 31-January. The first was received at 1107 AM reporting a grass fire at 11071 Combahee Road near Hendersonville. Within minutes callers to 9-1-1 reported a storage building on fire at the location and advised the grass fire was rapidly moving toward a mobile home. A full structural response was assigned, bringing four fire stations and additional firefighters to the scene. Click here for more information. Stations 1, 6 and 19 responded to a multi-vehicle head-on MVC in the 1900 block of Jefferies Hwy. at 1600, Friday 30-January. Apparently a southbound Dodge pickup truck struck the rear of a southbound Chevrolet pickup causing the Dodge to enter the northbound lanes. Click here for more information. Stations 19 and 27 responded to a multiple shooting incident at 55 Jared Road south of Walterboro at 1242, Friday 30-January. Sheriff’s Deputies cleared the scene prior to the arrival of Battalion 1. A 22 year old male was found to be deceased lying in the front yard with multiple gunshot wounds. He was pronounced dead at the scene. A second patient, a 19 year old male was found inside the mobile home... click here for more information. NEWS RELEASE: Three more convictions for staged auto wrecks brings total to 19 wrecks falsely blamed on wild hog, deer. Click here for more information. 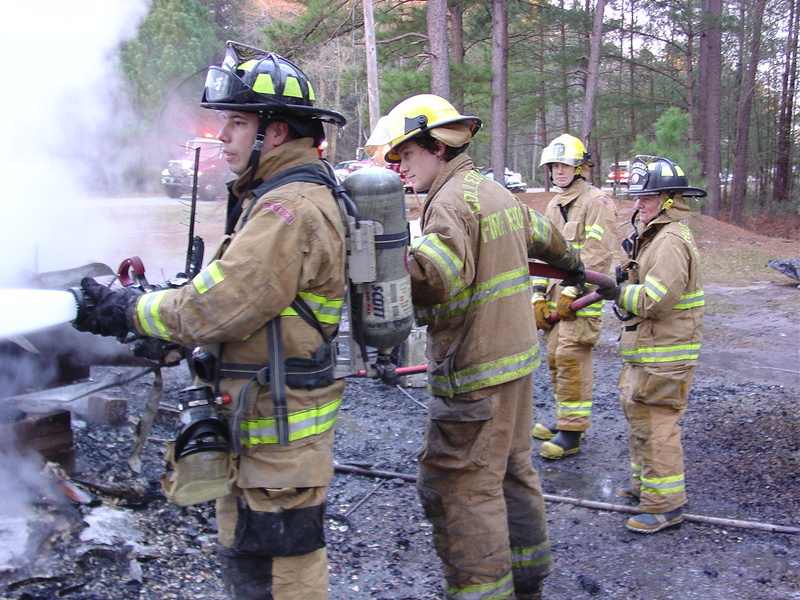 Southeastern Fire School will be held at the South Carolina Fire Academy on March 14 & 15, 2009. Click here for more information. The Tactical Response Team Trainings scheduled for Monday, January 26th and Wednesday, January 28th have been cancelled. Station 1, 2 and 6 responded to a two vehicle MVC in approximately the 5400 block of ACE Basin Parkway (US Hwy. 17) Tuesday 20-January at 1034. Apparently a southbound Honda, driven by a 22 year old College of Charleston Police Officer, crossed the center line and ran head-on into a north bound Peterbilt Tractor Trailer. The small Honda sustained heavy damage, careening off of the truck and striking the southbound ditch bank. Click here for more information. Six new full-time employees have completed orientation. Click here to read more information about them. Stations 9 and 19 responded to a high speed single car MVC in the 9000 block of Round O Road Sunday evening 18-January at 19:39. The southbound Nissan left the roadway, apparently striking a large tree head-on. The car then spun around and struck another tree backwards and was then thrown into a third tree. The car suffered heavy damage. 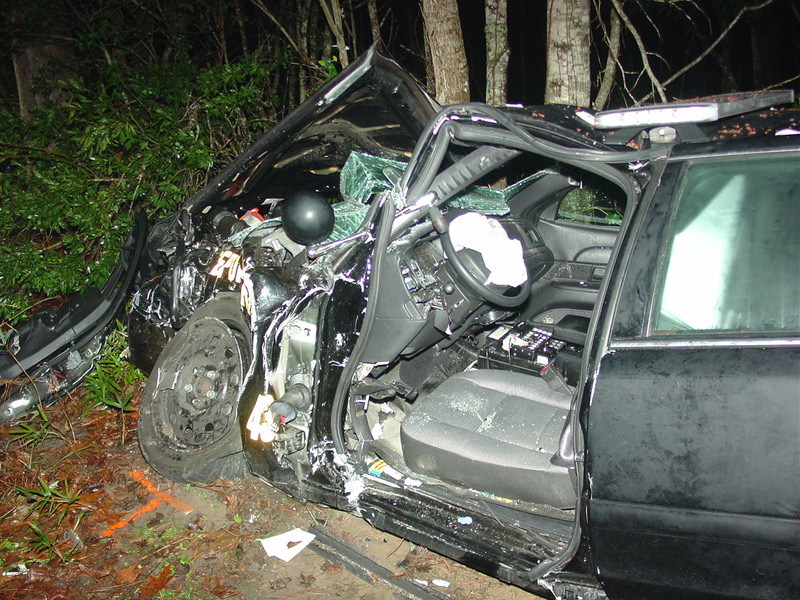 Both occupants were found outside of the vehicle, one about 10 feet behind the car and the other about 15 feet from the roadway near the front of the car. Click here for more information. 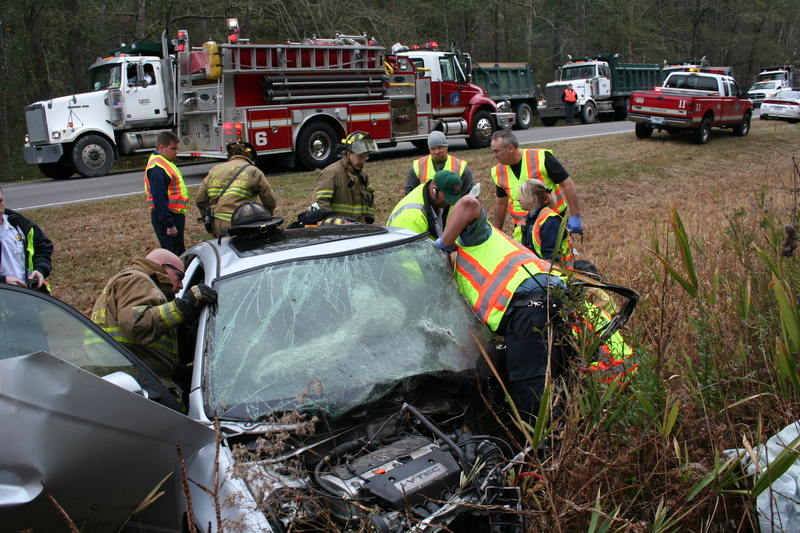 Stations 1, 18, 19 and 23 responded to a fatal two vehicle MVC on Broxton Bridge Hwy. (US Hwy. 601) just south of Confederate Hwy. (SC Hwy. 641) at 5:05 PM Wednesday 14-January. According to a witness statement, a Nissan Rodeo SUV was south bound on Broxton Bridge Hwy. and swerved to avoid a collision with a vehicle that entered the intersection from the stop sign. Click here for more information. OSHA Training and Fit Tests have begun. Click here to access the department calendar to see where and when the sessions will be held. 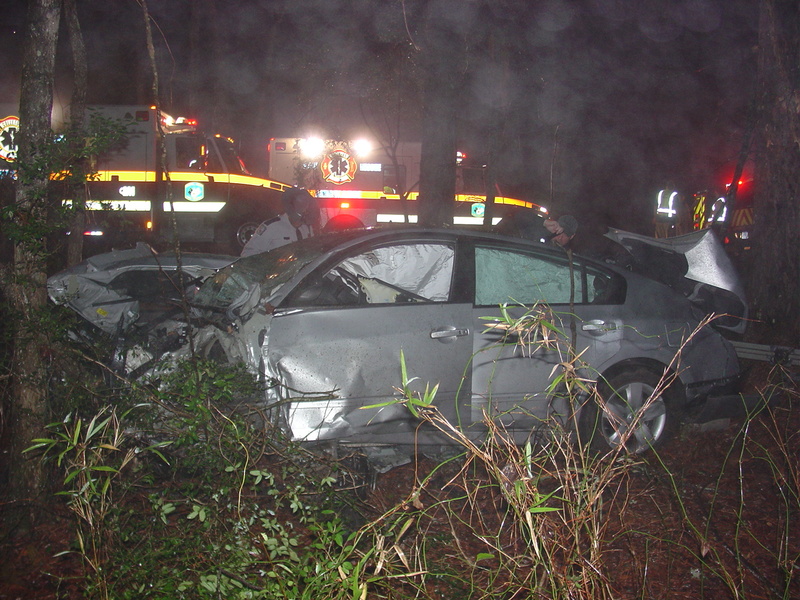 At 1826 Tuesday 13-January, Stations 1, 2, 6, 19 and 27 responded to a high speed fatal MVC at the intersection of Green Pond Hwy and Clover Hill Road. Apparently a southbound Sheriff’s Deputy collided head-on with a northbound pickup truck when the truck entered the southbound lane. Shortly after the initial dispatch, 9-1-1 assigned additional units to the call advising of multiple patients with persons trapped. Click here for additional information. 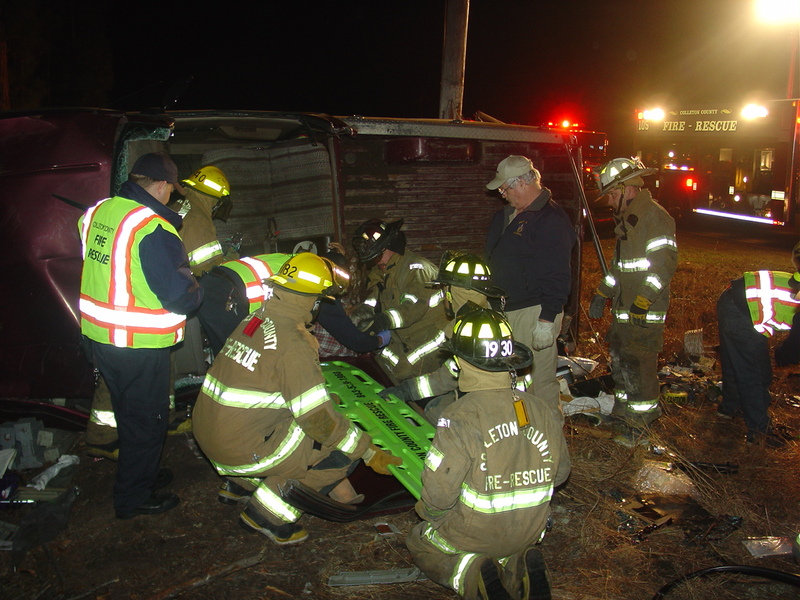 Stations 1, 9 and 11 responded to a rollover accident in the 7000 block of Rehoboth Road at 2341, Monday night 12-January. The south bound older model pickup truck left the roadway at a high rate of speed, over corrected and roll over on the north bound side of the road, striking a power pole. 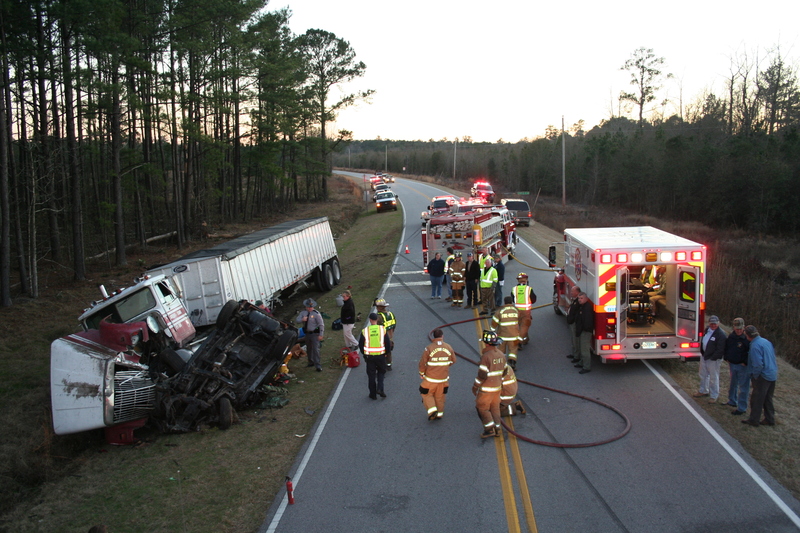 The truck received moderate damage in the collision thus trapping the 65 year old driver in the wreckage. The man suffered multiple non-life threatening trauma injuries. Click here for more information. 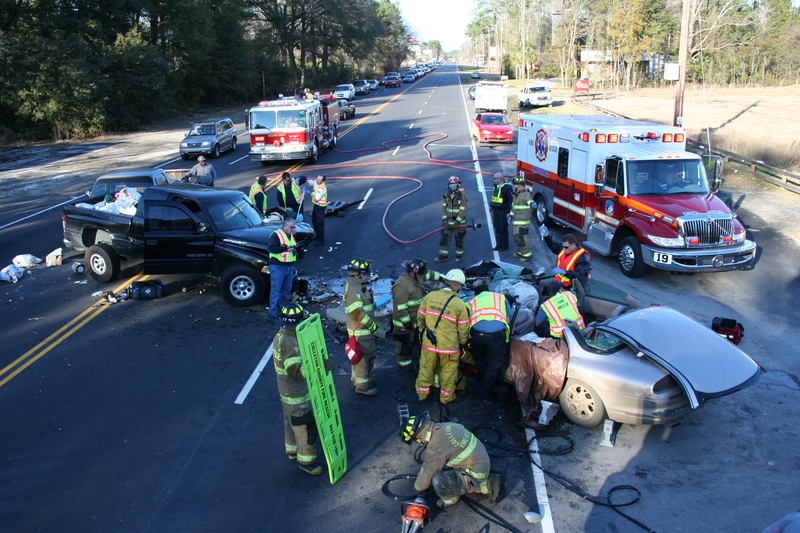 Any personnel interested in taking the EMT-Basic course scheduled to begin on 27 January 2009, please contact Firefighter/Paramedic Mary Allison at (843) 475-5744 as soon as possible. 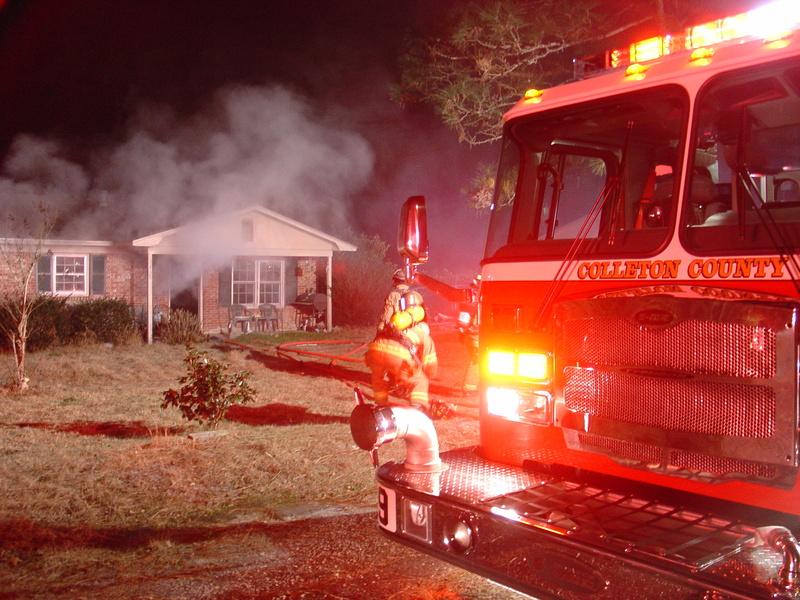 Stations 4, 7, 10, 15 and 18 responded to a fully involved dwelling fire at 535 Belton Lane in the Ruffin Community. The incident occurred on Thursday morning 8-January at 0637. Neighbors called 9-1-1 reporting they could see flames in the area of the doublewide mobile home approximately ¼ mile away. The structure was located in a wooded area away from other homes. Click here for more information. Stations 1, 19, 24 and 26 responded to a structure and woods fire in the 200 block of Juttner Lane at 1332 Friday 02-January. 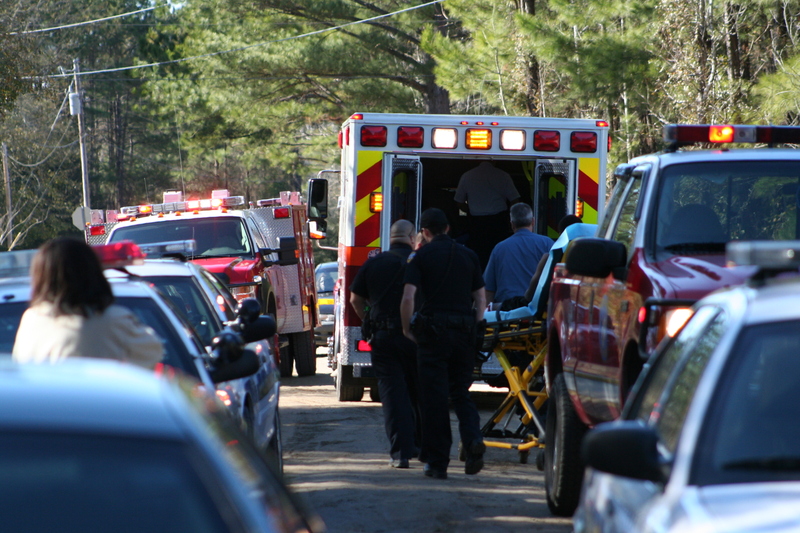 Medic 9 was returning to their station and responded from one mile away. 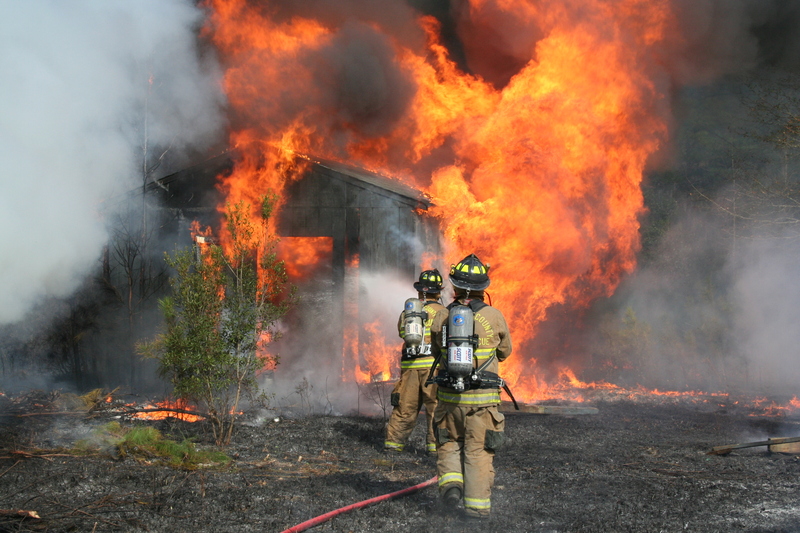 On arrival they reported a 20 x 30 wooden building well involved with a rapidly moving woods fire that was threatening a nearby singlewide mobile home. Click here for more information. Stations 19, 1, 24 and 26 responded to a working fire in a single family dwelling at 438 Carolina Circle at 0553 1-January. Engine 19 reported heavy smoke on arrival. Firefighters made entry with one 1-3/4 handline and quickly knocked down the fire, which was contained mostly to the hall. The homeowner stated she was asleep on the sofa when she smelled smoke and saw fire in the hall. She exited the home with several pets and notified 9-1-1. Click here for more information.